Do not let leftovers make you sick! As soon as you finish a meal, put your leftovers in the refrigerator. Make sure that the temperature in your refrigerator is 41 °F or colder. Put a piece of tape on the container and write the date on the tape. It is best to use refrigerated leftovers within 4 days. If you won’t be eating your leftovers in that time, put them in the freezer where they will keep safely. For best quality use the storage times in the chart below. Put liquid foods like hot soup or chili in shallow containers, no more than 2 inches deep, and then refrigerate or freeze quickly. Do not reheat foods in the microwave oven in Styrofoam or carry-out containers from restaurants because these containers can warp or melt and possibly transfer harmful chemicals into the food. If reheating in a microwave oven, use a microwave-safe dish, cover with a lid or paper towel, and turn the dish and stir the food to make sure it is hot all the way through. Your dish should indicate if it is microwave-safe, but if not, see HGIC 3586, Microwave Food Safety for information on how to tell if a container is microwave-safe. As soon as you finish a meal, put your leftovers in the refrigerator. Keep foods safe from the moment you buy them until you eat them by following these simple steps. Clean: Bacteria are everywhere—on cutting boards, knives, sponges and counter tops. Keep hands and surfaces clean to stop bacteria from making you sick. Always wash your hands in hot, soapy water before preparing food and after using the bathroom, changing diapers and handling pets. Wash your hands again after touching raw meat, poultry or seafood and before handling ready-to-eat foods. Use warm water to get your hands wet, then add soap and rub hands together for 20 seconds before rinsing carefully. Wash cutting boards, knives, utensils and counter tops in hot, soapy water after preparing each food item and before going on to the next one. Sanitize cutting boards and other surfaces that have been in contact with raw meat, poultry or seafood. To sanitize, immerse the item in a solution of 1 tablespoon liquid chlorine bleach per gallon of warm, not hot, water and leave for several minutes. Plastic cutting boards can also be sanitized in a dishwasher using the wash and dry cycle. It is best to use paper towels to clean up kitchen surfaces and to dry your hands. If you use cloth towels, wash them often in the hot cycle of the washing machine. Sanitize a non-metal kitchen sponge by heating it while still wet in a microwave oven for one minute. Avoid burns by allowing the sponge to cool before using it. Or rinse and squeeze out sponge and put through the wash and dry cycle of a dishwasher. Rinse fresh fruits and vegetables under clean, lukewarm, running water. Separate: Cross-contamination is how bacteria spread. 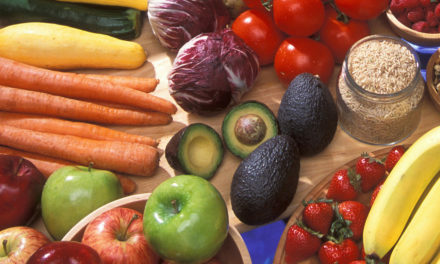 Keep raw meat, poultry and seafood and their juices away from ready-to-eat foods. When shopping, keep raw meat, poultry, seafood and eggs from touching other foods in your cart and in grocery bags. Store raw meat, poultry and seafood in a sealed package on a plate or dish on the bottom shelf of the refrigerator so juices do not drip onto other foods. Use one cutting board for raw meat, poultry and seafood, and a different one for foods that are ready-to-eat. If you have just one cutting board, wash and sanitize it after using it to cut raw meat, poultry or seafood. Never put cooked food on a plate that held raw meat, poultry, seafood or eggs until the plate has been cleaned and sanitized. Wash and sanitize utensils that have been used to handle raw meats before reusing them on cooked foods. Cook: Bacteria can survive on foods that are not cooked properly. Use a food thermometer to measure the internal temperature of cooked foods. Cook roasts and steaks to at least 145 °F. Allow meat to rest for 4 minutes before carving or eating. Cook mechanically tenderized or injected meats to 155 °F. Some stores now label meat that has been tenderized. If not, ask the meat manager if the meat that you are buying has been tenderized. The color of ground meat or ground pork does not show if it is safely cooked. Use a thermometer to check that it reaches 155 °F. Cook all poultry to at least 165 °F. Cook eggs until the yolk and white are firm. If eggs will not be cooked, first mix raw eggs with other liquids and heat to 155 °F. Chill: Bacteria grow quickly at temperatures between 41 °F and 135 °F. 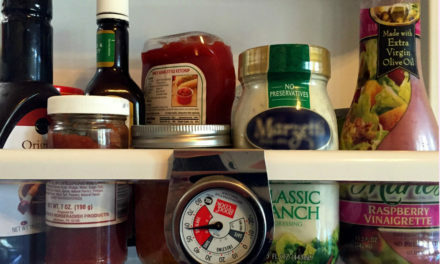 Keep leftovers and other perishable foods out of this danger zone! Refrigerate leftovers and takeout foods within 2 hours. The best place to thaw food is in the refrigerator. Food thawed in the microwave oven must be cooked immediately.